A Review of this important book edited by Annette Hames, a consultant clinical psychologist and Monica McCaffery, director of Sibs organisation. Illustrated by Brendan McCaffrey. As a Mum of two girls, the youngest of whom has Down's syndrome, I am always conscious of the impact Natty's additional needs will have on her elder sister. Most of the time when I look at how thoughtful and sensitive a ten year old she is, I think my early fears were unfounded. At other times I can see that Natty's behaviour can be a challenge for her, or that our worries and attentions are unfairly divided towards her sister through necessity. We try to take it in turns to take her out on special outings, or take part in craft activities with her alone, but I occasionally wonder if that is enough. So when I had the chance of reviewing a JKP book, I automatically chose a title about siblings to further my understanding of this issue. 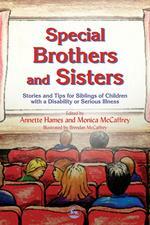 Special Brothers and Sisters is a collection of accounts from 40 families with children ranging in age from 3 to 18 speaking openly and honestly about their experiences. It has been compiled for siblings, their parents and professionals working with the family and is the perfect balance of personal accounts with educational explanations of key conditions such as ADHD, cystic fibrosis or Down's syndrome, as well as tips and ideas to try at home. The resource has been very well thought out. Children's concerns, worries and sometimes frustrations with their siblings are not sugar-coated in any way, but given respect and space. From embarrassment, staring, sleep disturbances, challenging behaviour, hospital stays, surgery, friendships and needing more attention, the book offers user-friendly ideas to work through these challenges, such as writing feelings down, talking to an adult or a range of calming activities to try with a sibling who may be experiencing sensory overload. These feelings are balanced perfectly with what the children love most about their family members, and what makes them proud. I think it's certainly a book to read together with your child as it will act as a springboard for further discussion of their feelings and needs and will work towards enhancing family relationships as you get a deeper understanding of how they view their sibling with a disability. In fact, I would urge every parent to read it for themselves as it provides a very grounding insight into how siblings feel. I enjoyed reading some of the stories with our eldest daughter Mia. It prompted chats about how she feels about being a mini carer at times for her sister Natty. For me, it was eye-opening to realise that even when we are feeling overwhelmed by caring, or our child's behaviour, some relatively simple and achievable steps can make a huge difference to family dynamics, such as explaining to school that a sibling has been woken at night and might be tired that day, or trying to organise a sleepover for that child, or simply drawing some silly faces that will make you all giggle. Parenting should be fun too! 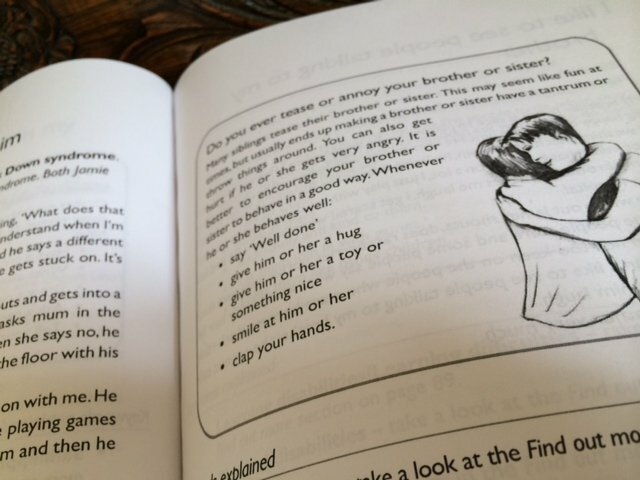 The book also contains a comprehensive list of where to get additional support and help, including UK based sibling support organisation Sibs. There's a glossary of medical terms, a note to siblings and a separate one for parents. This is an honest, compassionate book with a positive tone. It sends out a clear message that siblings of disabled children are not alone and are not being overlooked or forgotten. We found this book so useful that we are now passing it on to other friends we think might benefot from it.